Jigna Varu, Global Commercial Director at Micro-Fresh. 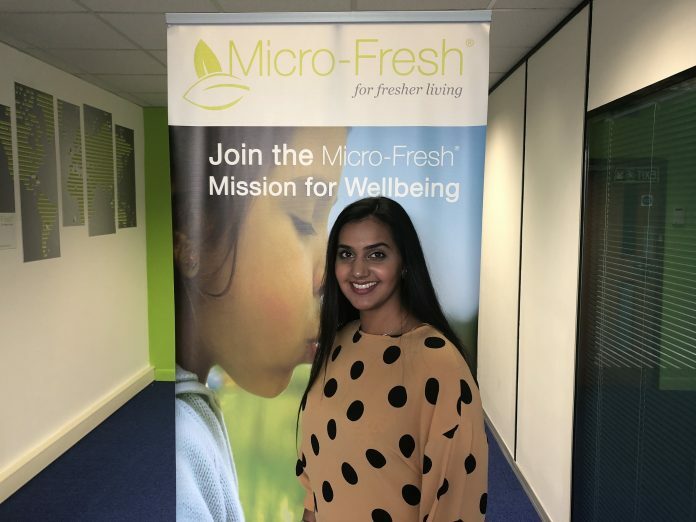 International freshness brand Micro-Fresh has made an exciting appointment, naming Jigna Varu as its Global Commercial Director. The new role sees the 28-year old take charge of the brand’s global commercial activities, including managing strategic partnerships and business development with its offices in Europe, Asia and North America. Varu joined the Leicester-based company in 2013 in a part time role in Client Services as her first job out of university, and has since worked her way through the ranks, working as the firm’s Global Commercial Manager before this most recent promotion. Varu said: “I’m incredibly proud to be heading up the company’s global commercial activity and continuing its success both at home and overseas. Byron Dixon OBE, creator of Micro-Fresh, said: “Jigna has demonstrated excellent customer awareness and has built excellent relationships with our growing client base, suppliers and staff in the UK and overseas. Appointing Jigna as Global Commercial Director was the logical next step as we saw she had the skills and ability to help the company grow, and this latest promotion recognises her achievements so far.